Lemon, lime and grapefruit in your water? You’ll be sittin’ pretty with this delicious, nutritious, citrus drink. Time for some lime-and-thyme-flavored water. Oh, and cucumber too. Splash your straw into some strawberry-flavored water. This fruitful recipe is sure to make a splash. You don’t have to travel to the Florida Keys to get some delicious Key Lime Pie. Just follow this recipe! 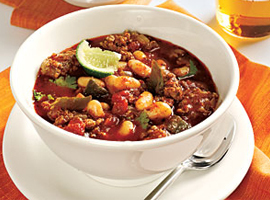 You’ll be in fine feather with this Low-Cal Turkey and Bean Chili. Just throw your turkey, some onions, beans, tomatoes and spices into a pot and let it cook.